From kids to corporate workshops, why not try your hand at learning some circus tricks and skills. 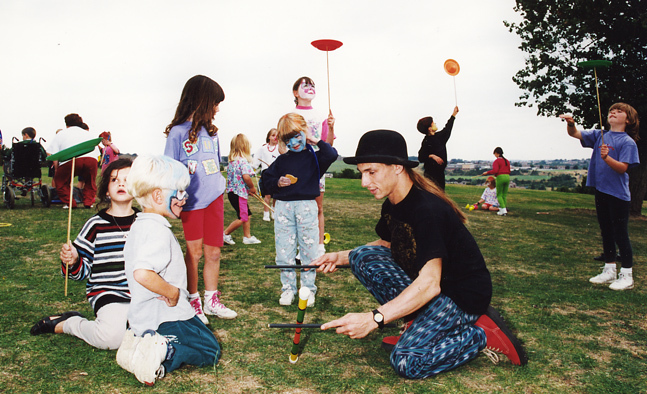 The most popular workshop covers plate spinning, diabolo, ball juggling, devil stick, (hand held) stilt walking, and unicycling. It's suitable for ages 7 and over, and requires a large, high ceiling-ed room. A two hour session gives everyone time to try each skill, although shorter workshops are possible. Whether the aim is to teach new skills or to provide entertainment, all the equipment used is demonstrated first, along with safety points, and one to one help is given throughout the session whilst participants have a go. Learning circus skills isn't dependent on some natural ability, but takes patience, determination, practice, problem solving. Although each individual must master the skills for themselves, groups tend to work co-operatively; observing each other, making suggestions, comparing approaches etc. Once the basics are mastered, there are many skills which can be performed by two or more people, where obviously all those involved must work together to succeed. All of this makes circus workshops ideal for a team building course, or just as a fun day out. All workshops are fully insured for personal injury. There are many other skills which can be taught including tightrope, various fire techniques and strap-on stilt walking; contact us for more details.
" I am writing to say a very big thank you for the contribution to Greentop Circus events last week. The client group of 25 had some major challenges that they needed to think through in a creative and non-threatening way - I was impressed how Tim an Emily pitched there work and how professional and enthusiastic they carried it out"